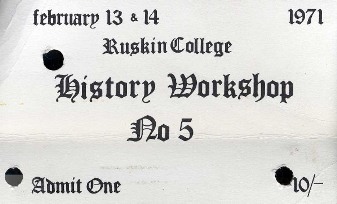 History Workshop 5, on ‘Workers’ Control in 19th Century England’, took place at Ruskin College on 13 and 14 February 1971. The theme was heavily influenced by Ruskin’s status as a labour college catering to worker-students. Because of this, there was a marked interest in the study of labour history – especially the history of work at the point of production. As with previous Workshops, a cultural event was included in the programme – in this instance a performance of John Walker’s play The Factory Lad (1832). 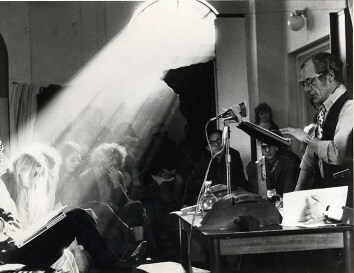 The overseer was played by Alun Howkins, while the factory children included Anna Davin’s children Kathy and Mick Hodgkin, and Sheba Phombeah (Ilona Halberstadt’s daughter). Seven sessions of the Workshop took place on themes including ‘Inside the Workshop’ and ‘Victorian Strikes’. Papers given included The London Bookbinders’ Strike of 1838, Lancashire Mill Girls 1850-1900, and Antonio Gramsci and the Factory Occupations in Turin, 1920. The speakers for this Workshop were a mixture of students and staff from Ruskin and university academics. The practice of drawing speakers from the ranks of professional academia, adult education, and the worker-students at Ruskin was a major element of early Workshops. 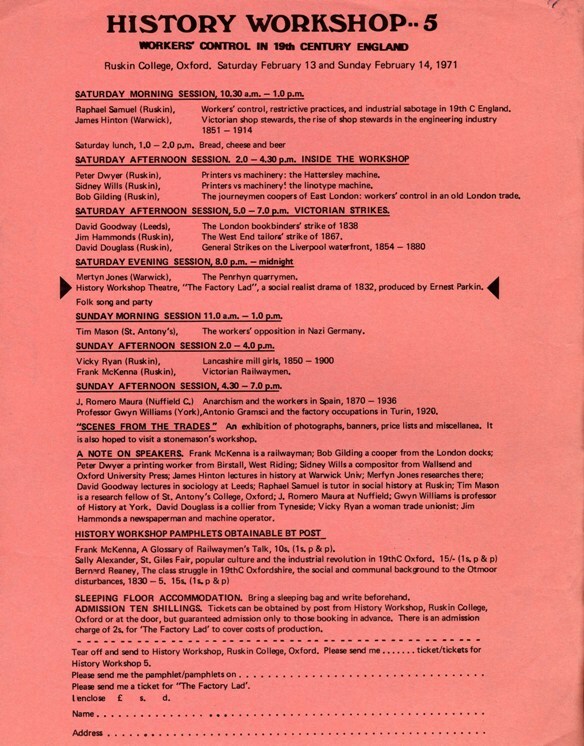 A number of the Ruskin students who presented papers to Workshops (including Bob Gilding, David Douglass, and Frank McKenna, who all spoke at this Workshop) had their research published as pamphlets under the History Workshop banner.